So Yong Kim’s ineffably lovely second feature Treeless Mountain, beginning from an autobiographical place in much the same manner as her auspicious debut In Between Days, focuses in almost microscopic detail on two sisters, 7-year old Jin (Hee Yeon Kim) and her younger sister Bin (Song Hee Kim), and their increasingly precarious existence after their mother (Soo Ah Lee) suddenly decides to search for the girls’ absent father. She leaves them in the care of Big Aunt (Mi Hyang Kim) while she is away. Big Aunt, a boozy and neglectful guardian, reluctantly takes them in and afterward can barely be bothered to look after them, leaving the girls mostly to their own devices. When Big Aunt finally tires of having the girls around, she sends them to the countryside to live on the farm tended by their grandmother (Boon Tak Park). That’s the story of the film in a nutshell, as simple as can be. But this description doesn’t begin to convey the magic Kim works with her materials. Alternating close shots of the girls playing, fighting, and roasting grasshoppers with startlingly lovely static shots of the sky, trees, and other natural phenomena, as well as a stunning landscape that concludes the film (all testaments to the skilled cinematography provided by Anne Misawa), Kim allows everything to unfold with an uncommonly patient subtlety that yields rich rewards. The film is so subtle, in fact, that it took me a second viewing (I first saw the film in Pusan) to fully appreciate its gifts, proving that it often pays to revisit films. The first time I saw Treeless Mountain, I did appreciate its visual beauty, but I felt somewhat emotionally distanced from what was happening on screen. During my second screening, that distance dissolved as I got more in tune with the intensely intimate nature of this film, and as I began to understand that Kim was making evocative use of a fairy tale structure to inform the girls’ journey. Abandoned children are a perennial fairy tale motif, Hansel and Gretel coming immediately to mind. What brought me to this reading was the detail of the piggy bank that the girls’ mother gives to them just before she leaves them, telling them that if they listen to Big Aunt, they will receive a coin for the bank. When the bank is full, their mother promises to return to them. This piggy becomes a magical object that the girls invest all their hope and faith in. One of the film’s loveliest and most humorous sequences occurs when they discover that one large coin can be exchanged for much smaller ones, after which they rush from store to store to exchange their money. When the piggy bank is bursting, they rush to a large pile of dirt and rocks (the “treeless mountain” of the film’s title) to await their mothers’ return. What occurs afterward becomes the poignant aftermath of lost illusions, especially for Jin, forced to grow beyond her years as a surrogate mother to her sister Bin (whose beloved “princess” dress reinforces the fairy tale theme). So Yong Kim proves to be not only a master of mise-en-scène, but a wonderful director of actors, of both nonprofessionals and veterans. Hee Yeon Kim and Song Hee Kim as the sisters are mesmerizing to watch, every gesture drawing the viewer further into their world, filled with as much humor and joy as sadness. (The two girls aren’t related in real life, despite a shared surname.) Song Hee is especially memorable, with her twinkling eyes and pixie smile. The fact that she is an abandoned child herself (So Yong Kim found her in an orphanage located in suburban Seoul) only makes her performance all the more remarkable. The adult actors impress as well. Soo Ah Lee, a veteran actress returning to films after a long absence, interprets her character with such bold strokes that she remains a strong presence in the film, even though we see her in very few scenes. Mi Hyang Kim skillfully conveys the delicate nuances of a character who is not simplistically evil despite her benign neglect towards her charges. 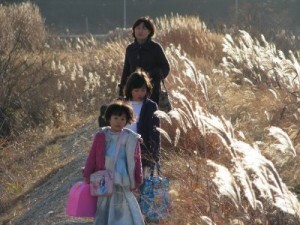 The contrasts between the film’s two locales, Seoul City and Heunghae (Kim’s hometown), are rendered in vivid detail, making the film’s exquisite pastoral conclusion all the more moving.